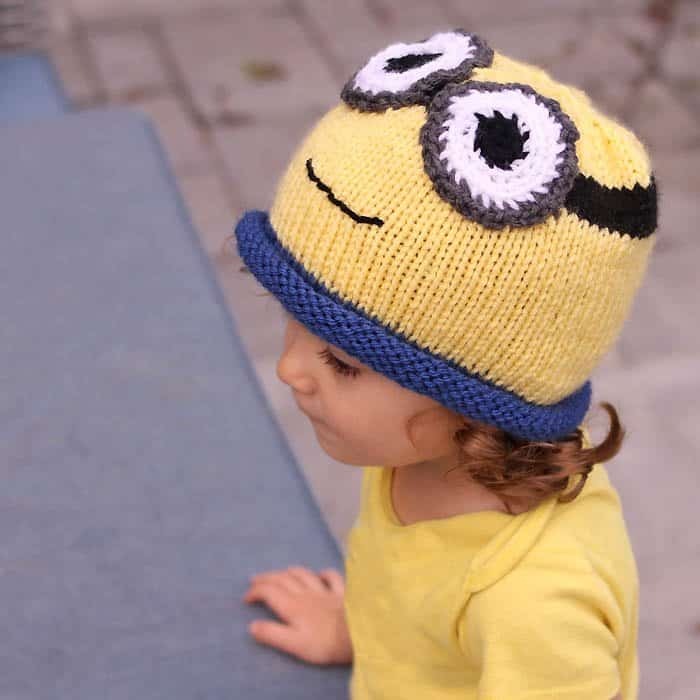 If you have a child, chances are they love the Despicable Me/Minions movies! 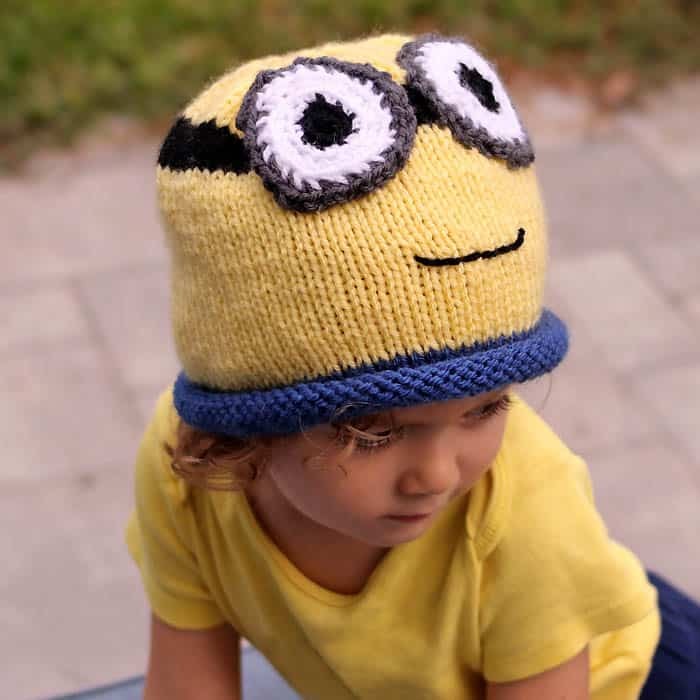 Since Halloween is coming up I thought it would be fun to make a Minion Hat Knitting Pattern. This hat (paired with overalls and a yellow t-shirt) would made a cute and comfortable Halloween costume that’s wearable all day. 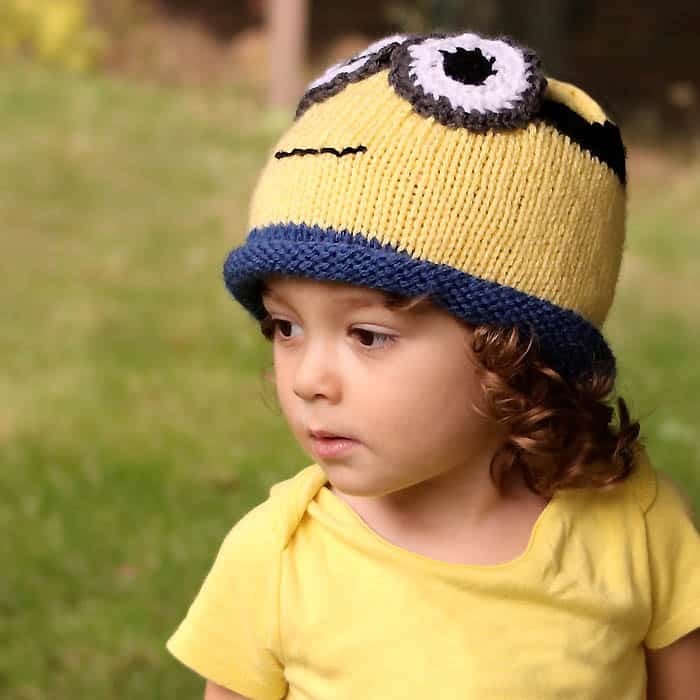 This Minion Hat is an easy knit. It’s knit in the round with a few color changes. The eyes are crocheted separately and then attached. If you don’t know how to crochet, you could also make the eyes out of felt and hand sew them on. I have more Halloween Knitting Patterns to share…in the meantime, Happy Knitting! Want more Free Halloween Knitting Patterns? With the blue yarn cast on 64 (68) sts. Join ends and place a marker. Knit in the round until piece measures 2 inches from the cast on edge. Switch to the yellow yarn and knit in the round until piece measures 6 1/4 (6 1/2) inches from the cast on edge. Switch to the black yarn and knit for 1 inch. With the yellow yarn until the piece measures 8 (8 1/2) inches from the cast on edge. How to make the eyes (make 2): With the crochet hook and black yarn chain 4 and join together. HDC for one round increasing the stitches to 8. Switch to white yarn. HDC for 2 rows doubling the stitches each round (16, 32). Switch to gray yarn and HDC 1 row. Finishing: Knot the eyes on to the black band. Sew down the outside of the eye with grey yarn. Stitch on the mouth.